Armed with Panasonic Varicam, Director of Photography Skip Clark Follows Races Around the U.S. The roar of the engines, the roar of the crowd. That’s NASCAR and the high speed rush of what has become one of America’s favorite sports. 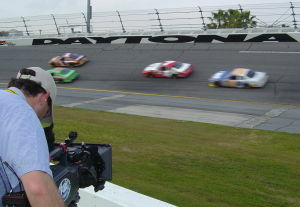 Beginning on February 9 for the 2005 season’s official start in Daytona, Skip Clark, director of the photography of Go To Team, was smack dab in the middle of it all. “While it is a big thrill, you really have to look all around you and need to have a definite sense of where you are because so much is happening,” said Clark. On assignment for Fox Sports Sunday broadcasts, Clark was charged with getting behind-the-scenes footage in and around every corner of the track, from the infield, the pit stop, in the pit road and stall, and even from a U.S. Army Chinook transport helicopter. The footage of every race was used for the following week’s Pre-Race Show on Fox Sports. NASCAR legends filled Go To Team camera lenses as Clark and his crew shot multi-camera interviews with Rusty Wallace, Waltrip and other drivers. Going strong and traveling continually, Clark could not quite recall where he was for one race when the Chinook unloaded him and the production crew when they followed Darrell Waltrip who drove a pace car for one race out of the helicopter. “Somewhere in Texas,” wondered Clark who added on location shoots in Florida, Ohio, Nevada, California and New York to his NASCAR log. Faced with a quick paced and demanding schedule, Clark fell in love with motor sports. In fact, he now considers himself a convert as a direct result of the experience. “The places we traveled to are a testament to the popularity of NASCAR and its national appeal,” noted Clark. “What was really cool was to be embedded in the first half of the circuit and feel the highs and lows of each of the drivers as the season progressed.” The tour was Clark’s second NASCAR go round and he feels like the production crew really became a more vital part of the action. “Compared to last year, where we only did 3-4 races and the whole experience was kind of new to us yet this year we became a more vital part of the team and sensed that Fox Sports viewed us as an essential partner.” Go To Team served client Chris Long, a Fox Sports producer who is now with the Speed Channel. Clark’s production team included producers Judy Hoang, Don Bui and Bill Richards as well as audio operators TP Barker and Dave Baker. A major highlight of the assignment was Clark’s brand new gear. Clark got to put Go To Team’s new Panasonic Varicam AJ-HDC27F camera to work. The Go To Team purchase marked the first high definition varicam camera to be owned and used by a South Carolina-based video production company. Among the HD cam’s amazing features are its stunning picture quality, robust color and amazing detail. The Panasonic Varicam is capable of variable frame rate at the touch of a button. s 20/20, Wachovia, and UPS. Locally, Go To Team has produced broadcast commercial campaigns for the Charleston Area Convention and Visitors Bureau and East Cooper Regional Medical Center.